Green lacewing are an excellent addition to any IPM (Integrated Pest Management) program, providing benefits throughout the growing season. Adults feed on nectar, pollen, and honeydew, but the larvae are active predators of soft-bodied insect pests: aphids, spider mites (especially red mites), thrips, whitefly, leafhoppers, some beetle larvae, eggs of pest moths, and mealybugs. Green lacewing larvae roam plant foliage looking for prey – pest eggs, nymphs or adults. Once hatched, larvae feed for 2-3 weeks, spin a cocoon, and emerge as adults 10-14 days later. 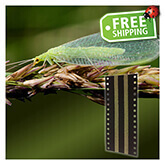 They offer season on season benefits and work well with most beneficial insects. Combine lacewing releases with companion planting and cover cropping to help keep adults around to lay eggs for coming seasons. 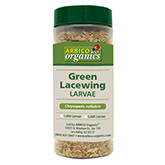 Green Lacewing Eggs: Best low-cost biological control for common garden pests. If you want to establish Green lacewing at the beginning of the season or have a limited infestation, choose the appropriate numbers of eggs for your garden or greenhouse. It takes 3-10 days for larvae to emerge following receipt of your order, depending on the temperature and other environmental conditions. Repeat the application in one to two weeks. 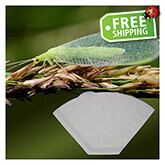 Green lacewing eggs are also shipped on hanging cards for easy release. Order a program and save with weekly shipments! 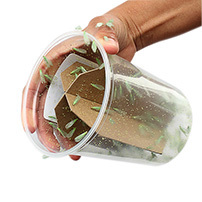 Larval Frames and Bottles: Best for immediate treatment of a pest problem. If you have a more severe infestation, consider the larval frames or bottles. They provide the quickest means to control unwanted pests with the larvae arriving ready to feed. 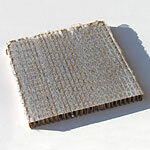 The larvae packaged in frames have small compartments that can be peeled open to make releases in various areas. Larvae are also available in a bottle, though it is more difficult to make even applications. Lacewing Adults: Best for establishing a population. 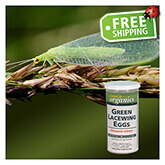 If you are treating a large area and want to create standing populations, order adult lacewing. The adults come ready to lay eggs and do so throughout your release area. They are minor pollinators and feed on pollen/nectar, but do not actively control pests themselves. Beneficial insects are most effective when released preventively or at the first sign of pests. Apply periodically over the course of a growing season. 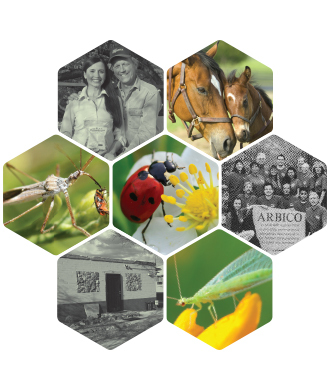 ARBICO Organics is happy to work with you to develop an IPM program; however, results will vary based upon growing environment, growing conditions (temperature, relative humidity), interactions with native insect populations, growing medium, etc. Please provide as much detail about each of these factors as possible when dealing with one of our pest control specialists. This allows us to make the most accurate and cost-effective recommendations possible.